Msgr. Lawrence Moran will be celebrating his 90th birthday on May 8. He graduated from Our Lady of Lourdes School in Indianapolis, and attended Saint Meinrad Seminary. He served at St. Michael the Archangel Parish in Indianapolis, the former St. Ann Parish in Terre Haute, St. Bartholomew Parish in Columbus, and the former St. Andrew Parish in Richmond. He then was assigned to Rockville and helped construct the new St. Joseph Church there. He was later administrator at the former Immaculate Conception Parish in Montezuma, then named pastor of St. Patrick Parish for 20 years in Terre Haute. Msgr. 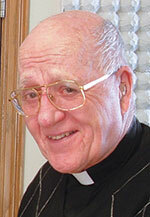 Moran also served as administrator of the former Holy Rosary Parish in Seelyville.